You are kindly asked to attend the Annual General Meeting of the Kenya Museum Society Wednesday, 20 April, at 6:15 pm at Ford Hall in the Nairobi Museum. See the agenda below. A new addition to the evenings’ proceedings is that the official opening of the new Joy Adamson Exhibition Phase 2 has been set to coincide with the AGM. The opening will commence at 5:30 in the Nairobi National Museum. Wine, juice and bitings will be served at the opening event. At 6:15 members will move to the nearby Ford Hall for the AGM. For those unable to arrive in time for the opening, Ford Hall can be accessed from the parking lot for the Louis Leakey Auditorium. The Joy Adamson Exhibition is principally funded by KMS, accompanied by a Ksh 50,000 donation from GT Bank. Because the NMK collection of Joy Adamson’s work is quite large, the second phase was created to display another 50 of Joy’s botanical, people and fish paintings and encourage return visits to the museum. The KMS Shop will be open for purchases, including greeting cards with Joy’s work on them and books by and about Joy Adamson. As previously announced, the date for nominations of officers or other Council members and the submission of resolutions closed on Wed, 6 April. 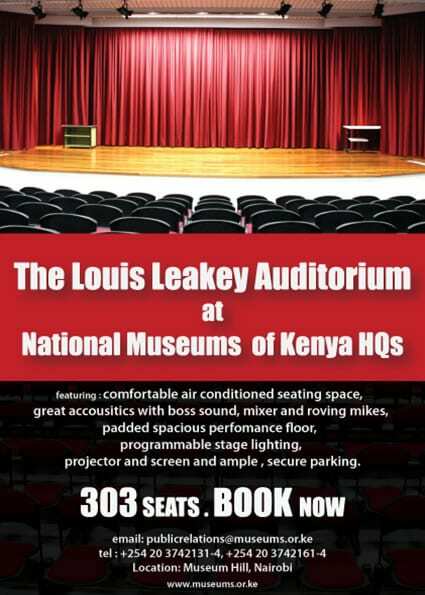 Please confirm your attendance or apology on or before Friday 15 April by phone (020 3743808, 0724 255299 or wireless 020 2339158) or by email (info@kenyamuseumsociety.org). If your membership has lapsed or will soon lapse you may renew prior to the beginning of the meeting. Though all categories of members are encouraged to attend, only paid-up members, exclusive of student members, visitor members, NMK special category members, and KMS staff, will be able to vote on any issues.